Samuel Breneisen worked in Reading during the last quarter of the 18th C and continued into the 19th C. He appears in the local tax records throughout the 1790’s and into the early 1800’s. 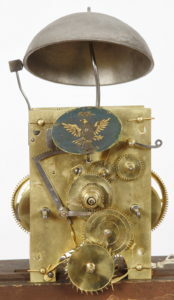 He had two sons that were trained as clockmakers: George and Samuel Jr. 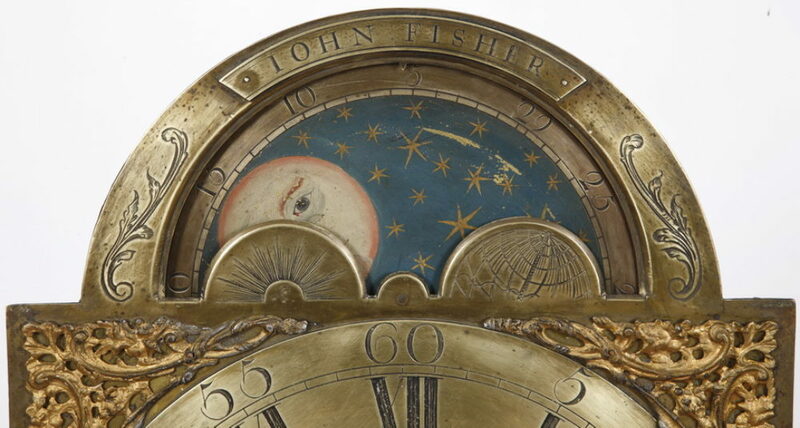 He also operated a shop in Adamstown, Lancaster Co. in 1807 and in all likelihood operated shops in Lancaster & Reading towards the end of the Federal period. He died in 1837. 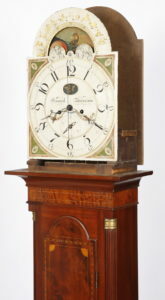 The clock in this listing is a wonderful example from the Federal period with quarter fan and herringbone inlay. The rich Mahogany case with choice crotch grain and wonderful rich patina. The broken arch scroll bonnet with applied open fretwork decoration with a center plinth and a wonderful period brass finial. The glazed bonnet door flanked by turned mahogany columns with interesting brass capitals. 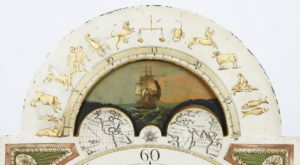 The door opens to the BEST American painted iron dial with polychrome spandrel decoration, gilt Zodiac decoration in the arch, lunar phase dial with an American flag flying on the ship, sweep seconds, calendar and a bobbing flying eagle automaton feature in an oval aperture above the center arbor. 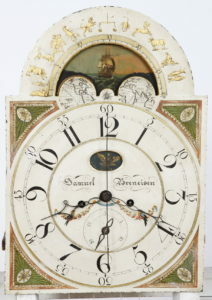 The dial retains the original signature by Samuel Breneisen. Below the cove molding is an inlaid panel that continues to an arch shaped waist door with quarter fan and herringbone inlay all flanked by fluted quarter columns. 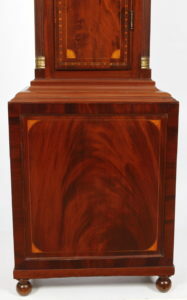 The base with inset panel continues the inlay theme with beautiful quarter fan decoration. 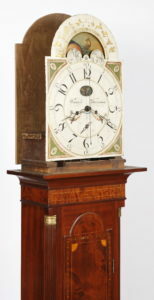 This monumental case stands at 101 1/2 inches tall and rests on it’s original ball feet. 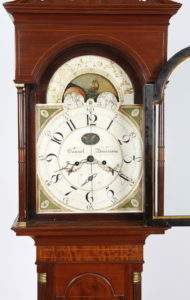 The works have been professionally serviced and the clock runs great.